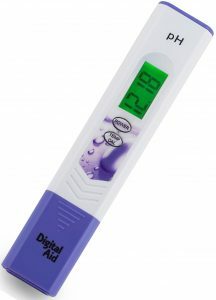 Digital Aid Professional pH and Temperature Meter with Large Backlit LCD Screen. Range 0.00 to 14.0 pH, 32 to 140F. Last pH & Temperature Meter you’ll have to buy, we’re so confident we offer a 100% Money Back Guarantee for Life! We know you will love this pH & Temperature Water Testing Meter.